We will be booking principal auditionees into time slots on the 13th, so please get in touch if you would like to attend. We would like to invite telented performers to come and audition for our next production The Wedding Singer. Suitcase Theatre (North East Wales - Mold) are going to be performing a locally written play about baby loss early 2020 at Theatr Clwyd, and are currently looking for a really special, experienced Director, with significant and proven experience working with challenging subject areas. For further information JUST REGARDING DIRECTING at the moment, please PM me or email. (Please note this is a Community Theatre production and not paid sorry). Philippa.davies@live.co.uk. Many thanks in advance. After Shakespeare’s death, two of his principal actors, John Heminges and Henry Condell, undertake the task of publishing all of his scripts, and the First Folio is born. Four centuries later in 2001, the First Folio is auctioned at Christies. 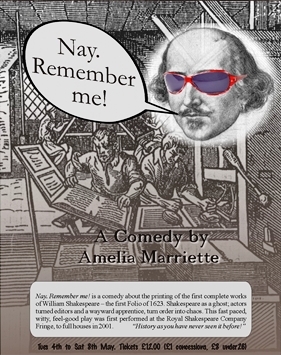 My play “Nay, Remember Me!” was recently published by Lazy Bee Scripts. It began its life as part of the Royal Shakespeare Company’s Fringe Festival in 2001. 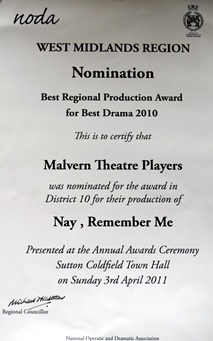 It has been revived twice by Malvern Theatre Players and toured to Devon. NODA nominated the last production for an award. Hi, Jane from Funky Fever Fancy Dress. Just wondering if I could let you know of our closing down sale which would be suitable for one off costumes and or group themes. We have three floors of top quality costumes all for sale at fabulous really low prices. If you could kindly share this with any interested parties it would be much appreciated. TO ALL THOSE CONCERNED WITH A NEED OF A SUPPLIER OF PROPER QUALITY AUTHENTIC COSTUMES WITH ALL ACCESSORIES FROM ALL ERAS. We have been supplyng television, film and amateur and professional societies from all over the U.K. and abroad for over 43 years and continue to do so. Please check our website and Facebook sites (see above) for an idea of some of our capabilities. Any queries please do contact us or visit us during our working hours to view our vast stock. What if popularity came in a pill? Liverpool theatre company WHAT WE DID NEXT will be performing the North West premiere of the critically acclaimed musical ?Be More Chill ?from 8-11 May at The Hope Street Theatre in Liverpool. 'If you fed DEAR EVAN HANSEN to the LITTLE SHOP OF HORRORS plant you would get BE MORE CHILL.' The New Yorker. Jess is co-directing with Andrew Ab, who previously directed Rent and I Love You, You’re Perfect, Now Change for What We Did Next. 'It's amazing to work on a show that has only been performed a handful of times around the world. We get to be really creative and put our own stamp on a show that’s going to get bigger and bigger. The music is so addictive and we feel incredibly privileged to be bringing this show to a Liverpool audience who will hopefully leave the theatre humming the tunes.' Andrew Ab, Co-Director. 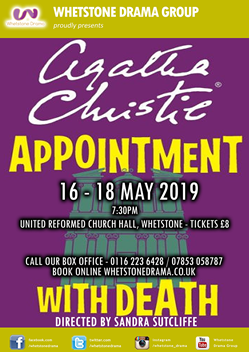 For What We Did Next it’s an exciting opportunity to perform at The Hope Street Theatre for the first time and to add to its extensive musical theatre repertoire, which it has built up over the last ten years. Years, Company and Into the Woods. What We Did Next was founded during Liverpool’s European Capital of Culture Year in 2008, by a group of recent University of Liverpool graduates looking for an outlet for their creativity, while starting out in various careers in and around the city. A decade on, they are thriving as a company and very much a part and a product of Liverpool’s vibrant cultural scene. The company defines itself as a team of ‘Professional Amateurs.’ Members include doctors, teachers, photographers and those who are training for a career on the stage, who come together to produce professional-standard theatre that otherwise may not be seen in the city. Quarter Box Office website here. The Saturday 11th performance has already SOLD OUT so get tickets quick so you don’t miss out! I am doing a big clear out at home and I have a bundle of scores and libretti from various shows etc from my days in an amateur operatic club. I am attaching a list and I am happy to pass these on. If this 3rd April is not possible, please still contact us to express interest. We are looking at other dates, as well. 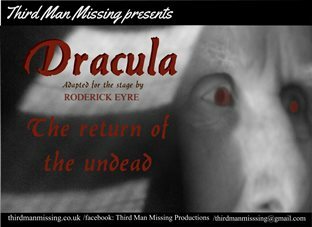 Background: The workshop is on a new dramatic interpretation of Bram Stoker’s Dracula. This unique, creative and thought-provoking production will challenge and stretch you in tantalising and exciting ways. 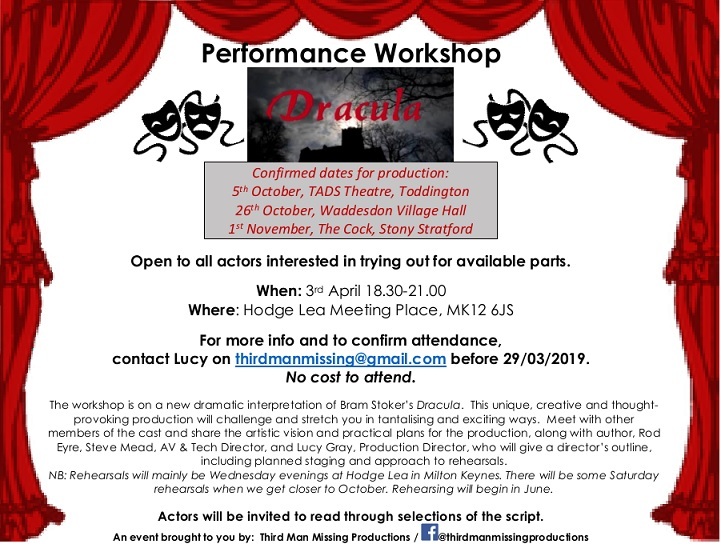 Meet with other members of the cast and share the artistic vision and practical plans for the production, along with author, Rod Eyre, Steve Mead, AV & Tech Director, and Lucy Gray, Production Director, who will give a director’s outline, including planned staging and approach to rehearsals. NB: Rehearsals will mainly be Wednesday evenings at Hodge Lea in Milton Keynes. There will be some Saturday rehearsals when we get closer to October. Rehearsing will begin in June. Actors will be invited to read through selections of the script. All genres of play and panto. Download full scripts on line or read 10 page extracts from each script free of charge. Script submissions from new playwrights encouraged. I am interested to know if any group has managed to succeed in getting performing rights for Victoria Wood's Dinner Ladies since her sad death, and if they managed to buy the stage scripts or just used the scripts in her books / can they be photocopied. Who they contacted to get performance rights because I read about four years ago that she granted the rights as long as payment went to her charity foundation. Thanks for any help! I have googled like mad. Most responses take you to a David Graham who denies being the one who adapted the scripts for the professional touting company. Thanks for posting your question. I shall make sure it gets published in the #Advice section of the www.dramagroups.com website and its associated Facebook, Twitter and Instagram pages within the next 24 hours. I shall ask people to contact you directly if they can help or advise. 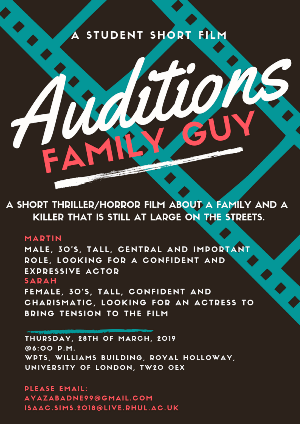 A short thriller/horror film about a family and a killer that is still at large on the streets. Sarah - 30s, tall, confident and charismatic, looking for an actress to brind tension to the film. Does anybody have multiple copies of Same by Deborah Bruce that they would be willing to sell?